« It’s Obama’s MAKE or BREAK WEEK again.. I am thrilled to be spotlighting one of Schmooru’s most worldly filmmakers [though there's a lot of competition out there!] who has worked in Peru, Australia and the US. Daniel was an amazing help in getting reactions to the US election in Australia for Current TV’s election coverage. He filmed, edited and delivered an amazing assortment of interviews within 24 hours [this included a hellish amount of technical difficulty] and had the best attitude during the whole thing. Daniel uses his talent to give voices to underrepresented communities around the globe and has dedicated his life to this service. Below you’ll get to know your fellow Schmoo who has a whole lotta heart and a ton of talent. Tell me about yourself as a filmmaker. Who/what inspires you? How did you get started? Working on a global scene provides me with many opportunities to share life with people and through the speaking of their stories, experiences, and challenges, film and print found their way into my journey. Desperately advocating for social justice for marginalized people, I have used the media of film to campaign for action. Amateur and humble beginnings led my journey to larger opportunities in the media environment. My inspiration comes from people. The lives and experiences of people thriving to survive motivates me to continue learning about film and using it to express current issues. Individuals like Eva Perón, Martin Luther King, Jr, and Mother Teresa inspire me. You’re one of our more worldly producers, can you talk about your various living locations and what it’s like to produce in the US vs. Australia and Peru. While passing through the States, I spend most of my time connecting with people, advocating for the current situations on global poverty, and getting Americans involved with what is happening in the lives of our families in developing nations. Living in three diverse cultures is complex, both socially and emotionally. Endlessly experiencing jet lag from countless hours of international travel predominantly reigns as most challenging and one that I have the least patience for. Working in film in Australia presents simplicity and distance. I find that the majority of Australian culture manifests a calm, collected, and reflective perspective. I typically spend a couple of months a year in Australia, living among the Great Ocean Road, five minutes walk to the beach, near the small town of Apollo Bay, Victoria. Filming is crisp, colorful, and quick. Rich blues of ocean water and skies mixed in with static city life in Melbourne is complex. Life is cruised, full of espresso, and wine, and very boring for me. Predominantly, I spend my time in Australia, waiting for my trip back to South America. Its like, well, hovering at 10,000 feet above Chicago’s International Airport, (ORD), in an eternally rotated holding pattern, munching nervously on that tiny bag of salted peanuts. I find that experiencing life in South America most exhilarating and emotionally charged. Life is diverse, challenging, and beautiful in South America. Additionally, life experienced among no running water, sewage, and electricity while filming in remote regions is challenging. Having permanent residency status in Peru, I make my home/office in capital city, Lima. I typically spend 8 months a year in South America. 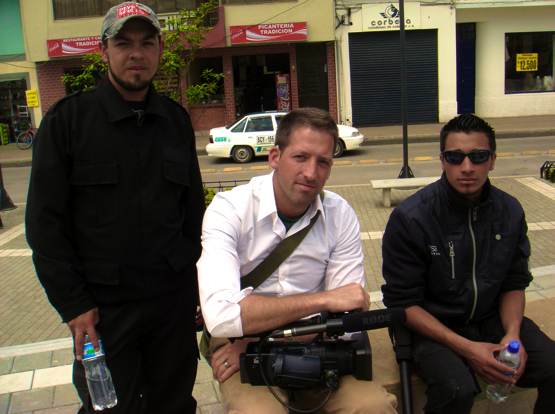 Working in film in South America is rich and engaging and completely involved. One of the challenging experiences however is limited access to western nations to connect the current story. Filming in South America involves potent smells, rich and deep textures in faces of people, and sights of risks while speaking out. Close brushes with danger are toxically real. I am editing a recent project on the Colombian militant narco-terrorist group, F.A.R.C, and their negative influence on the lives of teenagers and families in a community along the border of Colombia and Ecuador. I just flew out of Peru, South America last week after shooting another story on 21 teenagers living in a community with no running water become united through the formation of a soccer team. Next up? How the drug trade along Amazon River between borders of Colombia and Peru function among locals who steer away from illegal trade. Does anyone want to come along? Where do you think the media business is headed? And how do you as a filmmaker fit into that? As Internet based content continues to expand and evolve, I believe that as a filmmaker, it is crucial to remain educated. The ability to remain involved in the industry is much easier through viewer-based content and I believe that I have a responsibility to society to remain informed, educated, and aware of the paths that media industry is directed. What does being a Schmooru mean to you? Having worked briefly on a couple of projects previously, with one of Schmooru’s curators, I was invited to join in the Schmooru journey from its implementation into the world. I’m incredibly blessed and enthusiastic to be apart of the experience. Being a Schmooru involves watching diligently, listening intelligently, and acting boldly. I believe that being a Schmooru involves the responsibility of being prepared to sacrifice time, energy, and resources to aid in the growth, development, and expansion of an incredible dream. I believe that being apart of Schmooru is growing into a life long journey of amazing experiences. What has been the most rewarding/challenging piece you’ve worked on? Why? The most rewarding piece that I’ve had the opportunity to work on was Down to Dribble. I found this incredibly rewarding because through the creation of the documentation, response was initiated. As a result of this story, others got involved to advocate and speak for those who have been silenced by poverty. In reality, my experiences in telling the stories of others have yielded some uncomfortable security situations. Challenging moments include uncertain moments of compromised safety in order to advocate for the marginalized people. I can say that my experiences of being held at gunpoint by corrupt military officials, running for cover from stray bullets of gunfire between two drug cartels in Tocache, Peru, and being thrown into the back seat of a Toyota Helix with a pillowcase shoved over my head and taken down dirt tracks for 4 hours from Juanjui to Tarapoto, Peru rate among my most challenging moments, however, it has helped me to become the person I am today. I do not support the innate risk to put one’s self into danger, however, I will not stop advocating for justice for the marginalized people until I breathe my last breath. Huge thanks to Daniel for agreeing to talk to us about his amazing work. This entry was posted on Tuesday, September 8th, 2009 at 11:53 am	and is filed under Creative Process, Et Cetera. You can follow any responses to this entry through the RSS 2.0 feed. Both comments and pings are currently closed.